On September 10th in China, there is a national holiday known as Teacher’s Day. We lucky transplants despite being relatively new to the Chinese classroom, managed to benefit from it. We don’t get a bonus, and we don’t get the day off, but the students (already rather nice) are particularly thoughtful of the teachers on Teacher’s Day. I even received several nice cards, one completely handmade, from my students. It was really sweet, and caught me completely off guard. 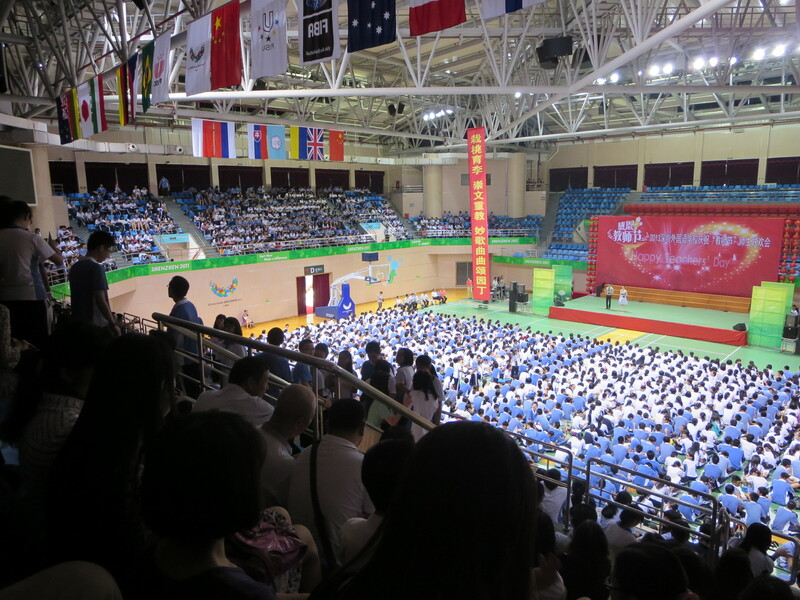 At the end of the day, there was a performance in the school gymnasium. I say gymnasium, but this is the nicest high school gymnasium I’ve ever been in; it was on par with the basketball arena on Tulane’s campus. It was arguably nicer, and inarguably much larger. The performance was completely unexpected (we found out about this holiday the on September 9th), and generally impressive. There were a couple of different student dance groups, one more oriented towards breakdancing and hip-hop, and the other focusing on ballet and traditional Chinese dance. There were also several different singing acts, some from students and some from teachers, all aiming to entertain the audience (which was almost every student and teacher). It’s a very large place. The stage is not usually there. It was mostly very entertaining, even if it got a bit carried away during the half-hour long skit that was an imitation of The Voice. The students started trickling out about halfway through, and I’ll admit to my own shame that I didn’t stay quite until the end. 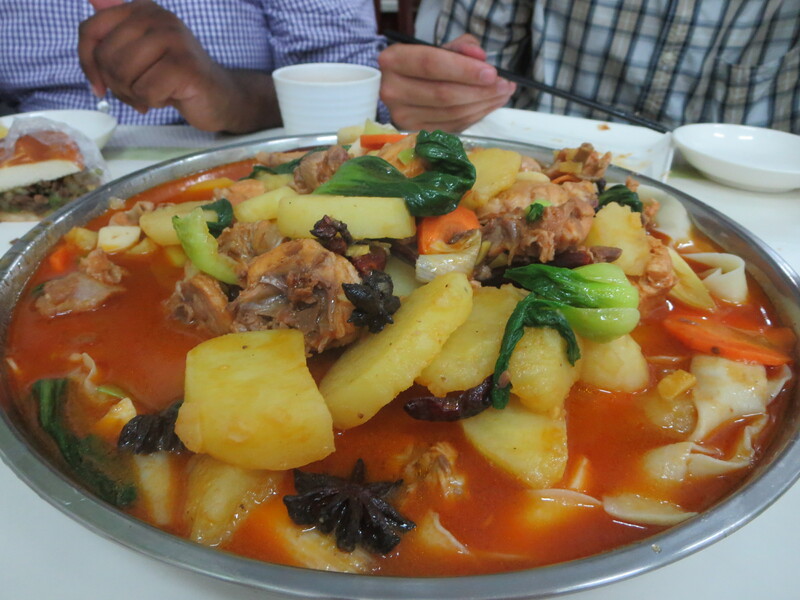 My rumbling stomach would not allow for it; instead, Adrianna, Kane, Sahal, and I all went to a cool little muslim noodle restaurant near our school We ate a dish called Dapanji (大盘鸡) which translates to literally “big plate chicken.” It is essentially a bunch of chicken cooked in a large plate/pot thing with potatoes, peppers, and this thick, wide noodles that are totally delicious. We also got some Roujiamo (肉夹馍)which is akin to a sandwich, except they flavor the meat with what tastes like taco seasoning, and it’s totally the favorite thing I’ve eaten here so far. It’s awesome. Anyway, that’s all for now from the PRC. Please send emails, comments, questions, etc. here. Oh, and if you haven’t subscribed yet (or don’t know how) you should look for the link at the very bottom of the page. Enjoying your writings. Especially the food pics, spellings and descriptions. I am also quite impressed! 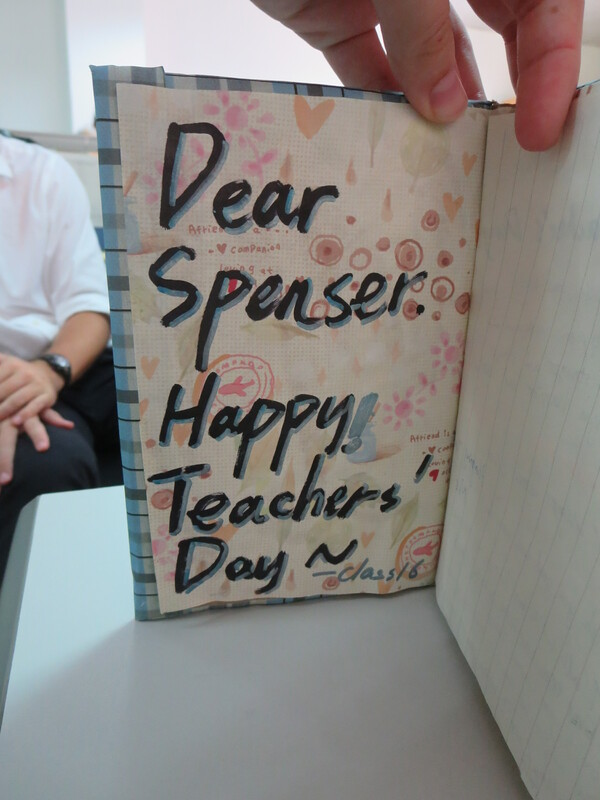 Happy Teacher Day to you both! Approximately how many teachers are there at your school? Have you seen any sporting events? There are about (this is a very rough estimate) 100 or so teachers at our school. There are quite a few. As for sporting events, there doesn’t seem to be like, a school team for any sports. Some of the classes play sports against other classes, but they just don’t care as much about competing with other schools athletically. It’s interesting, and one of the biggest differences I have noticed between school here and school in the states. I did not know that this was a holiday in China; this is another reason to vote China for my teaching…what do you all think?! I think it’s definitely a reason to come teach here. Every school is different though; some of our friends who teach elsewhere got flowers and candy, most did not have a big assembly, etc.